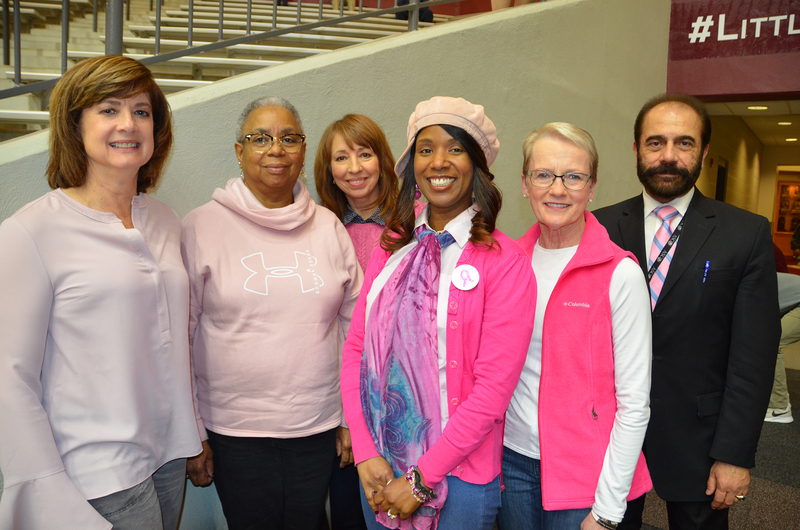 Honorees at the UALR women's basketball Pink Game were (left to right) Liz Caldwell, Donna Boxley, Laurie Shell, Abby Ellington, Terri Seiter and Issam Makhoul, M.D. Feb. 8, 2019 | There was plenty of pink to go around Feb. 7 when UAMS breast cancer survivors were honored by the UALR women’s basketball team at their annual Pink Night. Five survivors, along with hematologist oncologist Issam Makhoul, M.D., were introduced to the crowd and joined the Little Rock Trojans on the court for the national anthem prior to their game against the Troy University Trojans. 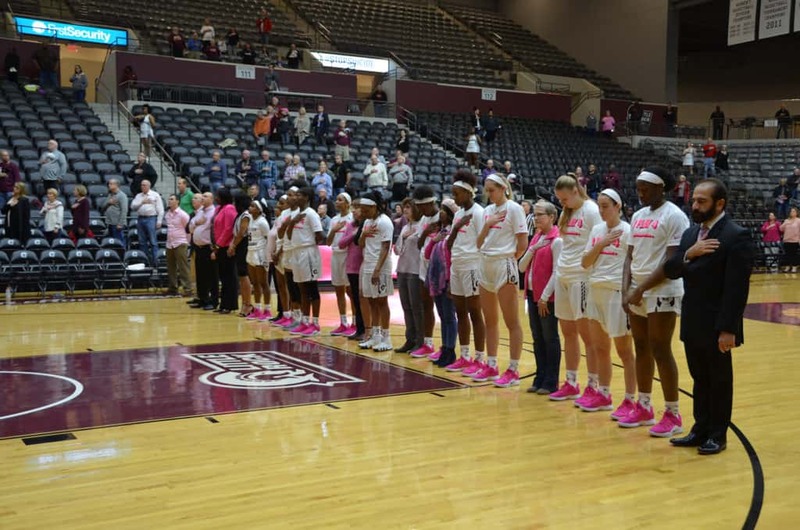 The UALR team, who won the game 76-72, wore pink shoes and jerseys in recognition of the annual event. UAMS breast cancer survivors and Issam Makhoul, M.D., joined the team on the court for the national anthem. Terri Seiter of Conway was honored to represent both her fellow survivors, as well those who lost their battle. “It’s a privilege to support UAMS and represent all those who have fought breast cancer,” said Seiter, a two-time survivor. Abby Ellington, mother of a 2015 UALR graduate, was happy to be part of the event at her daughter’s alma mater. “I love basketball, and I was honored to be here this evening,” said Ellington, who attended with her daughter, granddaughter, husband and mother. Donning a pink necktie, Makhoul shared hugs and words of encouragement with each of the survivors before the game started. “It’s a joy to see these courageous women here tonight with the families and friends who supported them through their diagnosis. They are truly an inspiration, and I’m so thankful UALR took this opportunity to honor their courage and strength,” said Makhoul, professor and director of the Division of Medical Oncology in the UAMS College of Medicine. Laurie Shell, a breast cancer survivor and former UAMS employee, said she was touched by the players’ willingness to share the spotlight. “They were genuinely happy to have us join them on the court and made us feel very welcome. These are obviously not just exceptional athletes but also kind and generous young women,” Shell said. Additional survivors recognized at the games were Liz Caldwell and Donna Boxley.